songs | Gee, Ya Think? Last night, my dear friend Kelsey and I decided to hit up Little 5 Points with our favorite trivia host to check out the karaoke at Little 5 Corner Tavern. 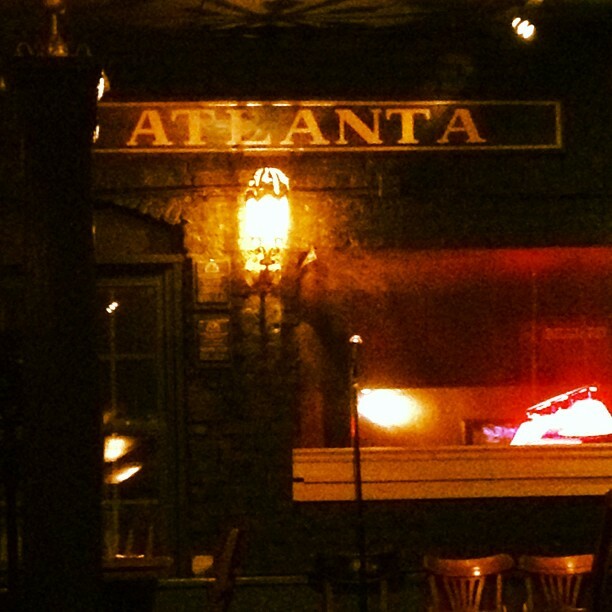 For Kelsey and me, this was our big debut on the Atlanta karaoke scene, and we had no idea what to expect. What we did know was exactly what we wanted to sing. There are those songs that you just feel in your heart. They are tried and true. They are the ones that you belt out in your car without a care in the world, feeling like a bonafide superstar. They may not sound as good to you in public as they do in the cozy comfort of your four-wheeled cocoon, but these tunes still give you an inexplicable boost of confidence. Those girly jams that shaped you in your formative years. Oh yes. We went there. We made three top notch selections. First up: “A Thousand Miles” by Vanessa Carlton. It’s upbeat, girly, spirited, optimistic. So full of hope and love. How can you resist that glorious piano? Next: “Say You’ll Be There” by the Spice Girls. I still remember watching a behind the scenes documentary on the filming of this music video in the desert. And of course, I still know ever word by heart. With this one, we had a true girl power moment. Big finale: “Teardrops On My Guitar” by Taylor Swift. This one was actually a bit tougher than we thought it would be – especially since the teleprompter was lagging behind. It’s one where I didn’t know the words quite as well as I thought I did. It’s a real heart-wrenching piece of T. Swift magic, but next time I think we’re gonna go for “You Belong With Me.” Oh yes – there will be a next time. And the girly classics will emerge once again. You know those songs that dominated the radio during your youth and essentially became part of your life’s soundtrack? You complain about them, but secretly adore them. They are strongly tied to your memories: sugary and sweet, embarrassing yet endearing. My roommate and I decided to revisit some of those classics the other day. The lyrics are corny, and the beats are pretty basic. But they tug at the heartstrings purely because of the memories that they conjure up. Cleopatra…comin’ atcha. They fueled my dream to become a pop group superstar. Disney Channel promoted them like crazy, so of course I gave in and bought their album. I had no idea that they were still goin’ strong these days! Hilary Duff. Oh yes. Let that rain fall down. We made fun of it, but were totally jealous of her when it became the theme song for that show we pretended to hate…Laguna Beach. We grew up with these silly songs. We loved to hate them, but really just hated to love them like we did. My advice: indulge in some of those guilty pleasure songs from yesteryear. Dance like a fool with some of your comrades. It feels so horribly good.